This custom hardback rectangle made of French parchment is over 12 feet long. It was entirely manufactured in our factory, from custom wire frame to custom packaging for delivery to the restaurant. Whether you need a standard styrene backed shade, a fire retardant shade, a washable shade or something completely different, Penn Shadecrafters, Inc can make it for you! -Knife pleats, shirred pleats, crystal pleats all made with our own pleating equipment! -All shapes and sizes available and made to order! 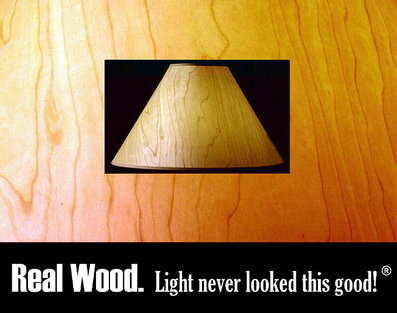 Penn Shadecrafters is pleased to introduce you to the striking beauty of real wood lampshades! These shades showcase a revolutionary, exclusive veneering process that allows wood to be shaved to a few thousandths of an inch thick, laminated to a translucent backing and shaped into graceful arcs of light. 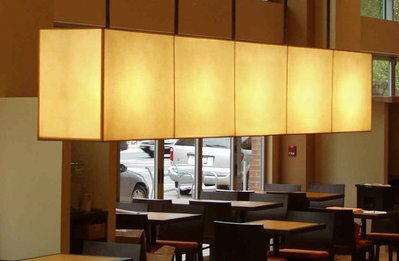 This technology, developed by Penn Shadecrafters, allows us to produce Natural Maple or Cherry shades in any shape or size. When illuminated, real wood shades glow with the warmth of sunset and add a sense of comfort to any home environment. Inquire today!